The bank manager is killed during a robbery. One of the tellers is Jenny, an acquaintance of Junior. Five-0 tracks the stolen armored truck by GPS and find the missing guard injured inside. The wife of the other guard, Carl, was abducted to make him redirect the truck. At Carl's house, they find a member of the heist crew dead, and Carl's wife alive and in shock. The surveillance shows that Jenny lifted up her head and stared at one of the robbers. She recognized him as Tory, the boyfriend of Junior's ex, Layla. Junior goes to visit Layla with her new son. She figures out he's checking up on Tory. 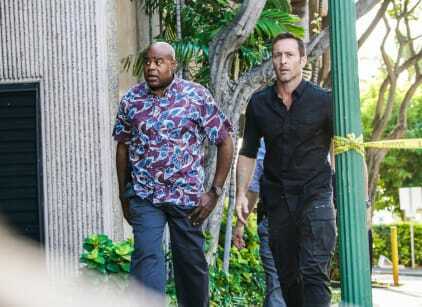 McGarrett asks Tani where Junior is. Junior ignores Tani's call and goes to confront Tory about robbing the bank, but he refuses to cooperate. The robbers meet up with Bob, the heist's mastermind, who gives them burners to call about the next job. Later he tells them Milo is dead. Tory lets them know about his encounter with Junior. Junior tailed Tory and shoots photos of the meeting. From the key card, Bob, who was a former armed-truck guard, is identified. Layla texts Junior wanting to talk. They pick up Bob and tell him they got his money from his safety-deposit box. Tory posing as Kayla lures Junior to the park, holding a gun on him. Junior offers to get Tory a deal and Tani, Adam, and Grover come as backup. Tory's partners attack. While Junior chases Tory, the other three take down his partners. Rather than go back to jail, Tory draws on Junior, who shoots and kills him. Tani tries to console Junior. He blames himself for the breakup with Laila, because he left to serve with the SEALs. Layla slaps Junior. I knew you'd make a great mom someday. Permalink: I knew you'd make a great mom someday. I get that Laila means nothing to you but she means a lot to me. Permalink: I get that Laila means nothing to you but she means a lot to me.